The vast amounts of oil extracted from Bakken shale in recent years, much of it in North Dakota, has helped the United States become the world’s top oil producer. The state has added about 100,000 workers since 2009, and the unemployment rate (2.6%) is well below the national average. The fact that nearly all oil workers are men has received much attention. Indeed, recent census figures show that North Dakota led the nation in population growth over the past five years, at 12%, and men have accounted for two-thirds of it. From 2009 to 2013, the number of men in North Dakota increased by 14% (46,000), compared with a 9% increase among women (30,000). From 1870 to 1880, Colorado’s population quintupled to 195,000 thanks in part to a silver rush (Colorado became a state in 1876). During this period, the state saw a 448% increase (106,000) in the number of men. Women also arrived in droves, but their population grew at a slower pace—a 324% increase (49,000). By 1880, men made up 67% of Colorado’s population. However, once the silver rush had subsided by 1900, the male share of the population dropped to 55%. Nearly 40 years ago in Alaska, construction began on the Trans-Alaska oil pipeline. Like North Dakota today, thousands moved to Alaska to work in the energy industry. From 1970 to 1980, the number of men in Alaska increased by 31% (51,000). But the population growth of women was even faster, with a 46% increase (60,000) over the same time period. 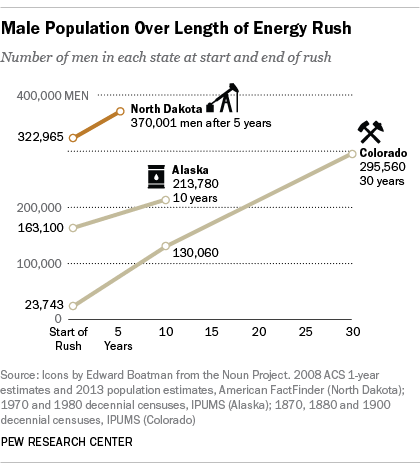 Today, North Dakota has the greatest concentration of men (51%) of any state besides Alaska (52%). Nationwide, men make up slightly less than half (49%) of the population and are a majority in only 10 states. Jens Manuel Krogstad is a senior writer/editor focusing on Hispanics, immigration and demographics at Pew Research Center. Where do the oldest Americans live? Oil and gas boom feeds greatest real wage growth in U.S., but will it last?